Two Aussies were in the hunt, but it was a Kiwi who came away with the lion’s share of the prizemoney Sunday on the PGA Tour Series-China. While Australian pair James Marchesani and Max McCardle were in contention for most of the day, they both finished on 8-under and in equal fourth spot, but four shots out of the playoff, won by New Zealander Nick Voke in the Qinhuangdao Championship. 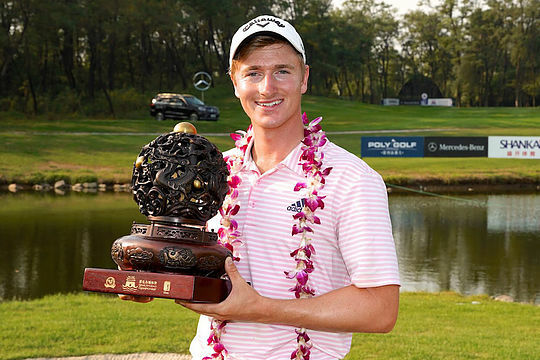 Voke, 23, has not played on the PGA Tour Series-China for long and only turned pro in January but has been quick to show his talent and won in a sudden-death playoff with England’s Stephen Lawton. The Auckland-based Voke finished with six birdies in a bogey-free final round and has set his sights on next year’s Web.com Tour after the victory propelled him to 13th on the Order of Merit. “This victory opens up some opportunities for me, and it’s pretty exciting to see what doors can open from it,” said Voke, who graduated from Iowa State University in 2017 after a college career that featured five victories. Any player in the top 25 of the money list after the Qinhuangdao Championship is exempt to the Second Stage of the Web.com Tour Qualifying Tournament, which will be held from October 30-November 2 and November 6-9. The 2018 PGA TOUR Series-China concludes it 2018 season with the Macau Championship (September 27-30), the Zhuhai Championship (October 4-7) and Clearwater Bay Open in Hong Kong (October 11-14). From the final Order of Merit, the top-five will earn status on next year’s Web.com Tour, top-10 players are exempt to the Final Stage of the Web.com Tour Qualifying Tournament from December 6-9 and any player ranked 11-25 is exempt to the Second Qualifying Stage.